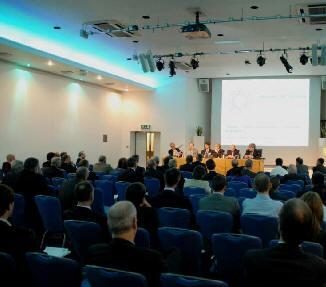 April 25, 2010 - The Royal Aeronautical Society’s (RAeS) annual conference concluded Thursday. The final presentations highlighted the contrast between the enormous potential for future wealth creation, exports and high-tech employment that could be generated in the UK aerospace sector with the warning that this could be put at risk if an incoming government ignored the need to adopt a more strategic investment agenda. The conference speakers, representing leading global businesses, academic institutions and aviation and defense organizations, provided a wide ranging series of presentations and Q&A sessions. The topics discussed stretched from the recent air travel crisis caused by volcanic ash to future prospects for safer and more environmentally friendly air traffic management, air finance, the expanding prospects for British involvement in space access and the changing needs and threats in defense. A thought-provoking presentation by Society Past President Professor Ian Poll, looked at how advances in radical new aerodynamic solutions for future civil aircraft might impact on airport design, airline operations and the environment. This considered performance gains and improved operating efficiencies resulting from blended wing designs set against competing factors, including developed conventional designs and implications for airport infrastructure. A controversial suggestion was that longer airport runways could allow more environmentally friendly air traffic patterns to be adopted, which might hold the promise of ending cloud-forming contrails at high altitude. Issues relating to the forthcoming Strategic Defense Review were considered at length. Sir Brian Burridge, Chairman of the RAeS Learned Society Board, pointed out that Britain’s ability to “punch-above its weight”, combined with its willingness to engage in active operations, had given it a global influence that could only be sustained if financial and political support was “equally robust”. New threats to the all-important digital connectivity of the global community included cyber and space access attacks, and these could, if not adequately protected, bring business, banking, travel and defense operations to a halt. The need to protect against future vulnerability of energy supplies was another area which indicated why defense threat analysis of the past was no longer appropriate in a fast-moving, technology-driven world. The two day conference took place at No4 Hamilton Place, London, the Society’s headquarters.